What with its past record, Kreludor was seen as a strong contender for the cup before AC XI. However, the team's underwhelming performance landed them with a 12th place finish last year - their worst ever. The Winner's Curse strikes again, it seems. In Altador Cup I, Team Kreludor and Haunted Woods formed an alliance known as "Haunted Moon". Returning to Altador Cup III as the 'dark horse'. They are known as (and self-proclaimed) as the 'Kreludorks' on the Neoboards. They are respected by most teams. Team Kreludor have a large fanbase. They are renown for being higher tier contenders in the tournament. At the time of The Return of Doctor Sloth (TRODS) plot, it was speculated that Kreludor's absence from the tournament in ACII had something to do with that. Shocking Neopia when they swept Team Krawk Island in the Second Round Robin of ACIV! They are very competetive and notably raced against their replacement squad in ACIV for a spot in the Finals. They suffered "the greatest upset in tournament finals history" (according to TNT) when squared off with Shenkuu in ACIV's Semi-Finals. Team Kreludor rose to championship status in ACV after exceeding to First Place potential. Team Kreludor and Team Haunted Woods have shown hints of re-establishing the "Haunted Moon" alliance in Altador Cup V.
In ACV they exceeded expectations by taking home 2nd Place. In the ACV off-season, Derlyn Fonnet had become penpals with Haunted Woods' "Brains" Mortigan. In ACVI the team came in 3rd Place, despite being in the #1 spot for a long time. It was just one battle after another for Team Captain Derlyn Fonnet and her squad! Below you can see how well Team Kreludor has performed in the previous Altador Cups. Ranked 6th out of 18 places. Ranked 2nd out of 18 places. Ranked 12th out of 18 places. Ranked 5th out of 18 places. Ranked 8th place out of 18 places. Ranked 3rd place out of 18 places. Ranked 2nd place out of 18 places. Ranked 4th place out of 16 places. Ranked 6th place out of 16 places. Were eliminated in round 1 out of 4. Team Kreludor had a rough time! Not participating in Altador Cup II, having their replacement team (Shenkuu) to outshine, getting used to Neopia's gravity... They have proven to be a mighty squad. The Lunar Squad impressed all by coming Third in ACVI! Kreludor were over the moon when they won 2nd Place in Altador Cup V.
Kreludor again outshined all competition when they placed 1st in Altador Cup VII. Teams participating in the Altador Cup can win additional awards for their team. During Altador Cup I, the teams who were awarded the extra awards were based on poll results from users. 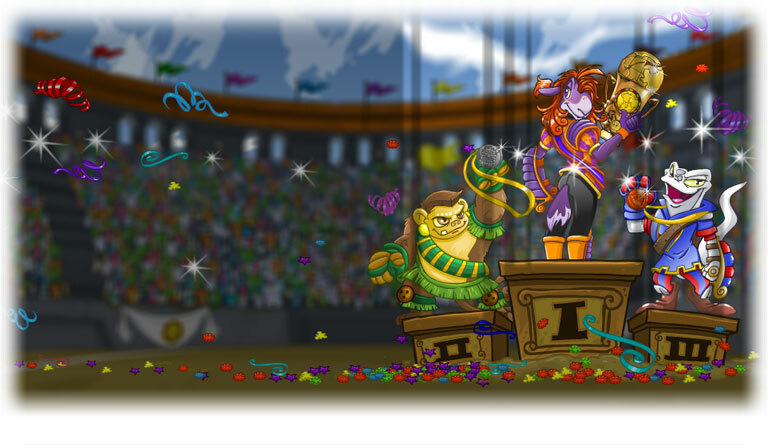 During Altador Cup II and III the awards were given to teams chosen by Neopets themselves. No additional overall team awards were given to any team after Altador Cup III. Like with overall team awards, no individual player awards were awarded to any team after Altador Cup III.